It was 1967 when the classic Star Trek episode "The Trouble with Tribbles" was first broadcast. As I mentioned before, it was a different time and I was not yet the worldly sophisticate that I am today. "Quadrotriticale" seemed like a wonderful, fictional, impossible grain of the future. When I discovered that triticale (trit ih KAY lee) was indeed a real grain, it immediately became my "favorite" for no other reason than it reminded me that the "impossible" could become real. Unfortunately, according to the University of Wisconsin, its desirability for bread making is less than that of wheat (but more than that of rye!) and my own first experience with it bore that out. But it remains my favorite and after my long baking/milling hiatus this panned bread project seemed like the ideal time to resume my obsession with this grain. How, exactly, to use it was the question. So I put my tiny mind to work bringing together bits and pieces of what I learned in the past year. Given that the gluten quality in triticale is low and given that a pre ferment (particularly a firm pre ferment) can be used to help increase gluten strength, it seemed that I should use triticale in the pre ferment. So after coming home from work (which involves things like full body scans) I fired up the mighty Diamant. I did a three pass grind to produce sufficient whole grain triticale flour to pre ferment 10% of the total flour. Why 10%? No reason except that I had liked the 5% pre ferment bread and was determined to push it just a little bit more. I decided to stay with a levain based pre ferment (as it had survived last week's elimination round) and to reduce the yeast very slightly to make up for a higher percentage of flour pre fermented. Triticale handles like rye, but more so. The 60% hydration pre ferment felt and acted like modeling clay. After 10 hours it did not appear to be mature, but when I poked it around a little, it had expanded slightly and showed pockets of air. If it had been wheat or if I were counting on the pre ferment for all the leavening in the bread, I would have been alarmed, but I was just doing this for taste and perhaps a little increase in strength, so I went ahead and mixed the dough. It was tacky, not sticky and in general was a lovely dough to work with. My feverish formula fussing had caused me to slightly increase the amount of total flour from the original recipe, but once shaped and put into pans, I realized that the pan sizes that served me well up until now were no match for this version. It rose like gangbusters, both during proofing and in the oven. So here is a picture of the loaf and the crumb, revealing tragic shaping flaws, the results of too small a pan, and a fine grained crumb (as I told you - brown loaf - fine crumb.) I do admire those folks with the presence of mind to take pictures during the process, but even when faced down with a scary pre ferment I still lack the verve it takes to document it pictorially. It was - delicious. I always sample my loaves, but frankly I'm baking a lot of different types of things these days (I am working on other things besides this panned bread) and if I let myself just eat what I wanted, well, I would be twice the person I am now and I'm not sure that would be good. But this stuff was too good to not eat. It is a very soft bread perfect for those (deadly, I am told) soft bread sandwiches, but also very tasty just plain and extra good toasted. Combine the two types of oats, boiling water, milk powder and shortening. Allow to cool to lukewarm. Add the salt, molasses, yeast, levain, and flour. Mix 5 minutes on the single speed of the spiral mixer. Or use your preferred method of mixing. Shape and place in greased pans. Proof (1 hour) and bake at 375F for 40 minutes. Remove from pans and cool on a rack. In a previous life I studied with a costume designer (actually, quite a famous one) who once told me that you keep adding until you think you have added enough and then - add one more thing. So I am now faced with a decision about the direction of my experimenting. Not only is triticale my favorite grain, but it really added a dimension to this bread. Do I push the percentage ever higher? Or do I call enough, enough and start tweaking other aspects of the formula? Life is pretty good when those are the kind of decisions you get to make. Stay tuned. Despite the advice of my graduate school advisor- "Rules are for suckers" (an attitude which I have always thought accounted for the number of indictments among those who went to the Dear Old Place) I have always been the kind of person who tries to follow the rules. So when (shameless plug coming) the Bread Baker's Guild of America (BBGA) tells me that soakers should be "hydration neutral" - I'll do my best to comply. This week's bake however left me wondering about glib statements and vowing that some teacher in some class in the hopefully near future will be faced down with unrelenting questions about what the heck that means and how does one achieve it. So it seems I have tipped my hand that I have included another soaker in my formula for panned bread. In what can be considered a daring move for me, I also included a pre ferment (Varying two things at a time - oh! the horror!). True to my nature, I agonized about just what kind of pre ferment to include. I just knew that a touch of levain would add depth to the flavor of the bread, but I thought long and hard about the general tone I have sensed on these pages that one must use levain to produce great bread. I continue to hold on to my belief that commercial yeast can still make great breads, but when push came to shove I realized that I have plenty of starter just hanging about the house waiting to be put to use, and it was foolish not to do it. Not that I wanted a pure levain bread - but a little bit couldn't hurt. As an offset to this I did lower the yeast content. But first, on to the soaker. I had some wheat bran in the house from an earlier milling run. Always mindful of folks' desire to get a little more "roughage" in the diet in painless ways, I was thinking about the bran - which could be re-milled to powdery softness and maybe - put in a soaker! How to determine "hydration neutral"? I thought that I had a method for that - just put a measured amount of water to the bran and then the next morning strain out the water and voila - hydration neutral! I was alarmed when the bran/water mixture became more a slurry than anything else but assumed (and you know what that makes of you and me) that in the morning the bran would settle to the bottom and all would be well. Meanwhile, I mixed up the pre ferment, which I made at 60% hydration so as not to use up too much of the water that would be poured over the oatmeal. I only wanted a touch of flavor, so I settled on 5% of the flour in the pre ferment (which is somewhat in line with what I have been using in my lean hybrid breads.) And so - to sleep, perchance to - oh, you know. Next morning full of the optimism that a warm and sunny day in the Mile High City always inspires in me, I confronted my bran soaker (well, the first thing - and I do mean the very first thing - I did when hitting the kitchen was to heed the words of "my teacher" who told us that we need to invoke our "baker's instinct" and always check the pre ferments upon entering "the bakery") which had, indeed, not settled out into any kind of distinct layers, but sat in the bowl as the same slurry it was the night before. As I poured it into my finest sieve, little water came out and it remained in the sieve as a quivering, gelatinous mass - not dripping water, but distinctly moist. Hydration neutral my clavicle. Nothing to do but mix it in and see what happened. What happened was a gloppy mess in the bowl of my precioussss. I've seen slack doughs in my life, but this was beyond that. I added measured amounts of flour until it became a soft, sticky dough. Of course, we are not supposed to do this. Why? Anyone? Bueller? That's right. Because we add other ingredients as percents of the flour and greatly adjusting the amount of flour will throw off the balance of the formula. But in my defense, this is formula development - not a final bread to be sold to customers. The formula presented below shows amounts against my adjusted amount of flour. After a fold, the dough behaved very well and was shaped/proofed and baked. How was the bread? I was right about the levain - it added depth of flavor without making the bread sour. The bran was invisible and did not interfere with the rise at all, nor did it seem to taste of anything. I'm not sure the bran was worth the effort and I'll be removing that from the next iteration (Bran Soaker, please pack your knives and go!). The levain will move forward, although I'm considering how that might morph next week. Still no pictures this week. I am doing a little work with the doctors at "the place" about why I hate photography so much and perhaps next week. But the loaves were brown little loaves - fine crumb. In the meantime, here's the formula that I used just so the record is complete. It isn't bad - it's just that the bran soaker was more trouble than it was worth. This doesn't have all the cool color codes of the BBGA formula format, but the actual data is in the correct format. Don't be too distressed by the baker's percentages - they are actually calculated as they should be and are correct, but may be just slightly different than others you have seen. Because I haven't converted the oatmeal solution to a proper soaker (since apparently I don't know how), there is a bit of variation with boiling water (for the oatmeal) and levain water being two separate water measurements. If you are baking this bread - do NOT use the "Total Dough" column to mix or weigh anything. Use the "soaker" area to weigh/mix for the soaker, the levain area to weigh/mix the levain, and the final dough area to weigh/mix your final dough. This is similar to, but not identical to the usage of columns in "Bread, etc". Be careful. I have a little quip about this, but it is too rude for TFL. Add the salt, molasses, yeast, levain, soaker, and flour. Mix 5 minutes on the single speed of the spiral mixer. Or use your preferred method of mixing. Let rise until doubled - 2 hours at cool room temperature. Fold. Let rise again - about 2 hours at cool room temperature. Until next time - Happy Baking! Panned loaves (to paraphrase) don't get no respect. It's the crusty, lean, free standing loaves that we tend to think of when we invoke the term "artisan bread." But, as others have pointed out - it isn't the bread that should receive the term "artisan" - it is the baker. I did a lot of bread baking during my "childhood" and that time was spent mostly in the 1960's. It was a different time. I learned to speak French early in those years, but Paris was an impossible dream. It had not yet become the place that I know almost better than the city where I live (or at least where I own property) - where I drop by once a year (barring extraordinary circumstances) to do the chocolate shopping (and take in the sights - I haven't become quite that blasé). Of course, in those years, the taste of a real French baguette was unknown to me - and to the vast majority of the people around me. What I baked was panned loaves. They were plump and brown like genial friars with a taste as heavenly as the personages they resembled. I have eaten my share of sour bread, of terrine with crusty loaf, of peanut butter on baguettes, and even fresh Poilâne miche (not completely sure why people pay vast sums to fly it all over the world, but that's me). Yes, there are pannini and those things you get from vendors in France with a couple of slices of something on a baguette or ficelle with not much else. But sometimes you just want a "sammich" - on soft bread. You know you do. You just won't talk about it in front of your foodie friends. At the end of last year I was visiting family in Southeastern PA - land of my birth - and found myself adrift in the world of mass produced bread. Apparently a substantial amount of money is exchanged for this stuff, but I really couldn't eat it. I could have written up a formula for an enriched loaf using the limited range of ingredients and equipment at hand, but after spending quite of bit of effort working on pre ferments/lean loaves/fresh milled I have become interested in the formulas I remember from my youth. You know those books (well, some of you do) - the ones from the "Ladies Farm Journal" with their tips on pleasing your man (making yeasted pancakes will do it, so I am told) and their enticing promises that this bread "always sells out at bake sales." The target audience was rural women - whose major charge in life was the daily feeding of a large, physically active family- with limited resources. They had to know what they were doing. The formula I ending up using produced some pretty nice bread and as I returned to the wild West I had to wonder what I could do to goose it up a bit. Since 2011 is my year to change and develop formulas for lean breads, I thought that I might add this to my baking plan. I tend to be a patient formula developer - tweaking one factor at a time and evaluating the change. I bake only once a week, so things take some time. Since there are many recipes for lean loaves n these pages I have similarly decided that my 2011 blogging project will be to chronicle how I work with this old formula and what it eventually becomes. I have also decided to abandon my ill fated attempts at photography. I have never been interested in taking pictures as my frustrated friends who are constantly saying things like "You spent three months in Malaysia and Thailand and never took any pictures!" could tell you - and I am singularly bad at it. These are panned loaves. They will look like a standard panned loaf of bread. They will have a fine crumb. I know that in the world of blogging if there are no pictures the blog is somewhat disappointing. Well, I'm writing this as much for me as for the one or two people who actually read my blogs. 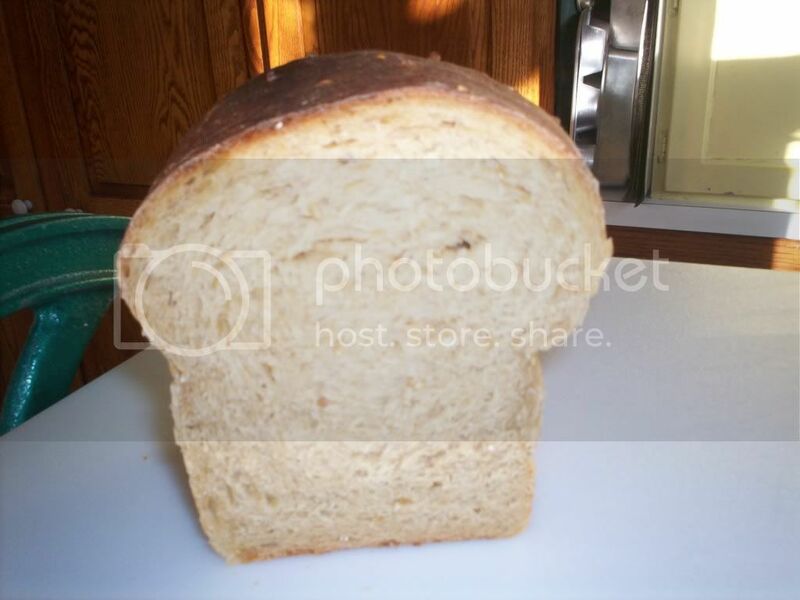 Perhaps if I get some real "show off" loaves I will find someone to help with the photography, but I just don't have it in me to do it myself. We all have our limits. The first step was to bake the formula mostly as written and to get the thing converted to weights so that I could analyze the baker's percents. So here is the first formula with my notes. Combine the two types of oats, boiling water, milk powder and shortening. Allow to cool to lukewarm. (this would be a "soaker" except that it is not hydration neutral - whatever liquid is not absorbed by the oats is very much needed for the hydration of the final dough. I may rework this in future iterations). So easy. Honestly. I haven't put that little effort into baking a loaf in awhile. 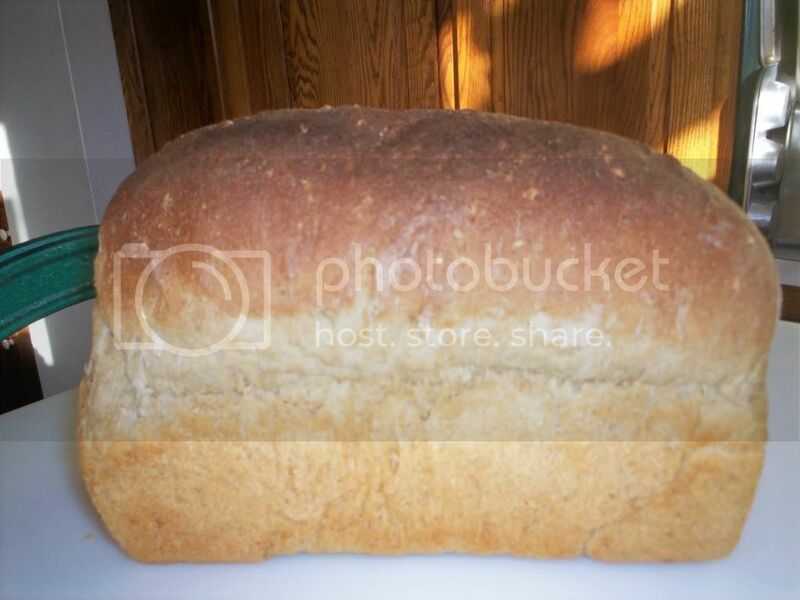 There was absolutely nothing wrong with this bread. It had a mildly sweet taste, was soft and moist with a moderately soft crust. I was a bit concerned that the steel cut oats would be too hard, but they added a soft crunch to the bread and were very nice. The molasses gave a nice color to both the dough and the finished bread. But naturally, there were things that could be better. Bearing in mind that this bread had to stand against an assortment of levain based breads when I was tasting, I missed the kind of depth that a levain based pre ferment brings to even commercially yeasted breads. I also have a lot of milling products (like bran and high extraction flour) that I could incorporate if they would be an improvement. Although tempted to do cracked wheat as an inclusion, I am going to stay with the steel cut oats, as oats add not only a subtle sweetness but their own share of healthy oat fiber (not that I am baking for health, mind you, but if it can taste good and be healthy, that's win-win) and really the inclusion of oats is the basis for this variant on standard white bread. The formula does not leverage any ingredients local to the Western US - other than wheat, of course. I have all that triticale that I was going to mill, but haven't - yet. I thought it might perform better in panned breads. Maybe that can be included. Looking at the formula, the hydration seems high, but it is offset by the oats (now we know why the BBGA wants the soaker to by hydration neutral - so that hydration is more easily understood by looking at a formula. There is always a reason...) My "guesstimate" is that the hydration is between 58-68% (remember to add in the molasses!) which is well in the region for panned breads, so I won't be playing with that just now. Same with the fat content - that's pretty standard for a good old loaf of bread. The salt and yeast seemed high until those troublesome oats were factored in. Yeast still seems high to me - there is a real candidate for reduction. My bread testers tell me not to change a thing - they loved it. But I still think I can make it better. So I am considering what to do. Yes, I could make a whole lot of changes at once, but I gotta be me. My instinct tells me that working some levain into that formula somehow (without making a pure levain based bread) would make a big change without using a lot of ingredients, but I have a week to think about it. We shall see. Even in what passes for "normal" in my life, mid-November to the end of December ranges from busy to insanely busy. There are jams to package, candies to make, and cookies to bake. Being the designated holder of family culinary traditions, the doing, packaging, and shipping can take on a life of its own. As the one or two of you who read my blogs know, 2010 hardly started out as a "normal" year. I had high hopes it would quickly settle to normal. But it was not to be. Doesn't mean I don't keep up with the bread, though. Lately I've been getting some big bear bites as I try to adjust my usual formulas to use two pre ferments. I'll have to admit, my mental mise en place was somewhat lacking and some very, very odd things came out of that fancy, new oven. Today, however, I looked over at the days baking and thought - "It's far from perfect, but that's some nice looking bread." I've been varying the percentage of flour in the preferment all over the map. What I found, is that reverting to my old faithful of 12-15% of the total flour pre fermented once again, did the trick. Mix the flour, water, polish and levain to a shaggy mass. Autolyse for 30 mins. Bulk ferment 4.5 hours at 72F, stretch and fold at 2 hours. Divide and pre shape. Rest for 25 minutes. Proof for 1 hour 30 minutes. Bake 5 minutes with your favorite home steaming method at 500F conventional bake. Switch to convection bake at 480F (I love my new oven...) for 12-13 minutes. Since I have the convection oven, all my loaves (even the ones where the bear gets me) sing pretty nicely and the crusts are quite crispy even after the bread is cool. The taste? Not a really assertive levain taste, but definitely more flavor there than a typical poolish baguette. The crumb is much more yellow than I can capture with my negligible photographic skills. I would describe the taste as "creamy." This formula hasn't passed the "I baked this for many weeks and it is consistent" test, but I though I would share. I had the chance to be with one of my oldest friends and some of his friends the other night and it hit me like a ton of bricks that my time in Okinawa had changed me in some pretty profound ways and that I will never be quite the same person ever again. I think it all came out on the plus side, but the changes are real. So why keep baking the same old bread? So I decided to goose up some of my formulas. The bear is still getting me as I get my hand skills back (Will I ever be happy with my scoring? No. I'm learning to live with that.) and of course, if you change everything, consistency (which is the bugaboo of little minds, but is something I like) takes a backseat. But though I'm not a picture taker the levain baguettes this week were worth a snap. Flour, pre ferment, and water into the mixer (hooray I finally got me that mini spiral!) mix to shaggy mass. Autolyse for 20 minutes. 5 hours total bulk ferment, one fold. Proof on couche 1 or so hours - seam up. Bake at 500F for 4 minutes with steam then 14 minutes at 480F with convection. Remove from oven. Bear is still getting me on the scoring, but that crumb is getting to look pretty nice (too bad I can't take pictures - it never was "my thing" and I'm thinking that part of me didn't change.) The crumb is profoundly yellow and the taste as always. Crust stays crispy even after cooling. And I'm loving that new oven. Singing loaves every time! 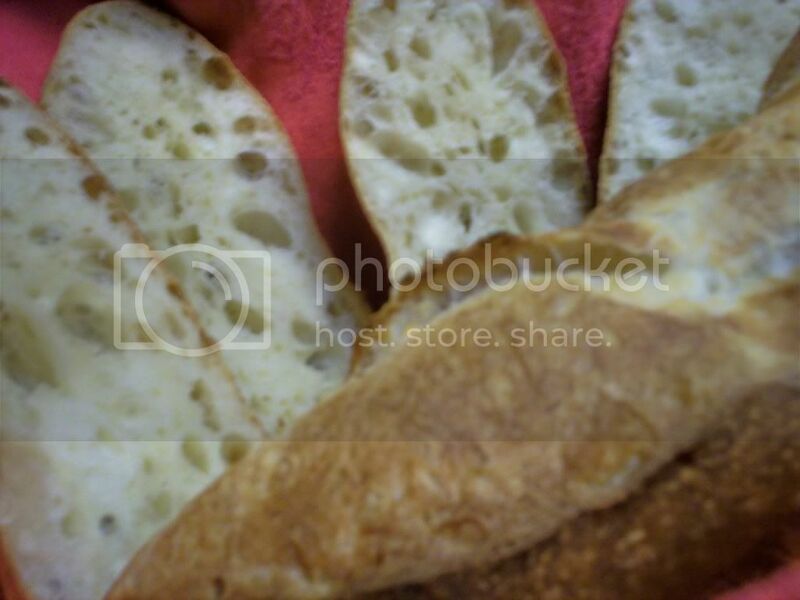 I'm also working with a commercially yeasted baguette with two pre ferments, but that isn't ready yet. Stay tuned. For any Marines out there - my best wishes as the anniversary of the founding of the Marine Corps approaches. Stay safe. And if I may say it "oorah!" Winner - TEAM USA!!!!!! They ROCK! 8:30 AM - a full hall to listen to Ciril Hitz talk about laminated pastries and brioche. There were, however, some points that were both useful to home bakers and quite memorable. Mr. Hitz spent some time talking about mixers for making bread dough in general and sweet doughs in particular. He is a big proponent of the professional needing both a spiral and a planetary mixer. He described the action of the spiral mixer as a trip to the massage parlor (it's Las Vegas...) - your back is rubbed with long strokes and eventually feels just right - the muscles have been worked. A planetary mixer, he opined, was more like a bar brawl. One person throws the other against a wall and eventually the muscles are worked, but in a much more violent way. I've never quite heard it put that way before. It will take some time for me to get that image out of my head. Continuing on he said that the most important thing to evaluate when choosing a planetary mixer is the tolerance between the dough hook and the bowl. If it is tight, the dough will pick up well and mix cleanly. If it is loose, the dough will ball on the hook and make trouble. This is certainly something I have seen with my faithful KitchenAid (which will soon be supplemented with a spiral) where the hook clears the bowl by several inches. But the spiral really is a "one trick pony" - it exists to mix dough. It does not cream or whip, so for someone working pastries, the planetary mixer will still be required. For home baking, Mr. Hitz likes the Viking (now, don't everyone rush out to buy it - although independently I have heard good reviews on this mixer) he feels that with it he can develop dough 25% faster than with a KitchenAid. He also weighed in on the great fresh vs. instant yeast debate For all of his baking, especially at Johnson and Wales, he has transitioned all of his formulas to instant yeast. He claims that he can find no degradation in the finished product. He uses a conversion factor of .4 for fresh to instant rather than the more traditional .33 (and I am still too sensitive on the subject to report what he said about yeast and salt during mixing.) Please, let's not open that debate, I just thought it would be interesting to report this, because he is a picky man with strong opinions. He also describes osmotolerant yeast as "the way to go" for any sweet doughs. He feels it lasts up to six months in the refrigerator (hardly "forever") once the package is opened. As he was showing us pictures of over fermented pre ferments, someone asked about making use of those. The distinguished bakers who gave us the lectures on pre ferments had indicated that they could be used - with some product degradation - at a lesser percentage of the total flour. Mr Hitz expressed agreement, (especially about the product degradation) but told us that when his students allow the pre ferment to get over ripe, he makes them use all of it because next time they will pay better attention to what they are doing. I write 'em like I hear 'em. A class with Mr. Hitz is not really a logical linear progression. It is a kind of Mr. Toad's Wld Ride - high energy with bits of learning on the way. So we are now reduced to some great quips and quotes. On proper gluten development: "There is nothing that beats time and controlling dough temperature in a proper development." On butter: "I cannot emphasize enough that the butter used in lamination must be at least 83% fat content." Any other butter must have a drying agent (flour) added to avoid it cracking apart in the lamination process. He also passed on a tip he had gotten from Peter Yuen (if you don't know who he is, type the name into your favorite search engine) which was to drill a 1/8inch or so hole in the bottom of brioche tins so that the steam could dissipate and the bottoms bake evenly and flat. Mr. Hitz is currently in the thrall of blast chillers (for some good reasons) and the question and answer period had spun itself out to a discussion of the best way to use these marvels. So I had a more important destination - the competition area for the LeSaffre Cup. I neglected to mention the teams that competed yesterday. Once again, very beautiful breads. Peru had a fabulous decorative piece of a working pendulum held aloft on framework of bread. Very nice. The ceremony to declare the teams who would compete at La Coupe du Monde de la Boulangerie had a familiar air. Folks went on and on in three languages (too bad for Brazil, eh?) thanking everyone who was even remotely connected with the competition. There was of course the City of Las Vegas, the Bread Baker's Guild of America, many individuals, the artisan baking community in general...Oh, you want the results? Teams would be chosen for South America and for North/Central America. There would be a challenger team and the team that would actually compete in Paris. After a martoonie or two and an early night, Tuesday 8:30AM found a very large crowd of bakers and imposters ready to listen to Craig Ponsford and Jeffrey Yankellow talk about the science and application of sourdough based pre ferments. Both seemed somewhat subdued and I was reminded of a quote about folks in another party town who made an early morning appointment. When they rolled into the restaurant for breakfast they remarked to the waitress that their counterparts were late and they could have used that extra few minutes to gently recover from the previous evening's festivities. The waitress said (to paraphrase) "You're in Las Vegas, boys, those people you are meetin' are expectin' a mess." No, no, it was nowhere near that bad. In fact speaking about sourdough is always a little less precise than speaking about commercial yeast and I think most of us who work with sourdough know this. What surprised me was the number of professional bakers at the lecture who had never worked with sourdough. Here on TFL it seems that "everyone" is a sourdough baker, but maybe not so much in the commercial baking world. Again, there was a lot to the lecture, but there were some high points worth discussing. Mr. Yankellow made a distinction between a "culture" - which he defined as a newly formed mixture of flour, water, and organisms and a "starter" ("chef" or "mother") that is a mature culture strong enough to use for baking. The transition, to his thinking usually takes 3 or 4 weeks (not many years) and, he emphasized, it is important to take the time to let the culture mature. He did discuss that a type of bread (similar to salt rising bread) could be made from a young culture, but he expressed that it would have a very strong taste (from all the random bacteria) and be a very heavy bread. Then both Mr. Yankellow and Mr. Ponsford held forth on the myth of special sourdough starters being grown from grapes or raisins or any number of odd things. This is where I tread carefully because there is much emotional energy attached to the origins of starters. I'm just saying that both of these distinguished bakers were convinced that the yeasts in the flour used to feed the culture and later the starter will always be the yeasts (and bacteria) in the starter. Yeasts from grapes (for example) - and grapes are a fruit with a lot of yeasts - will not thrive in the flour and water environment and eventually be out competed by the yeasts in the flour. 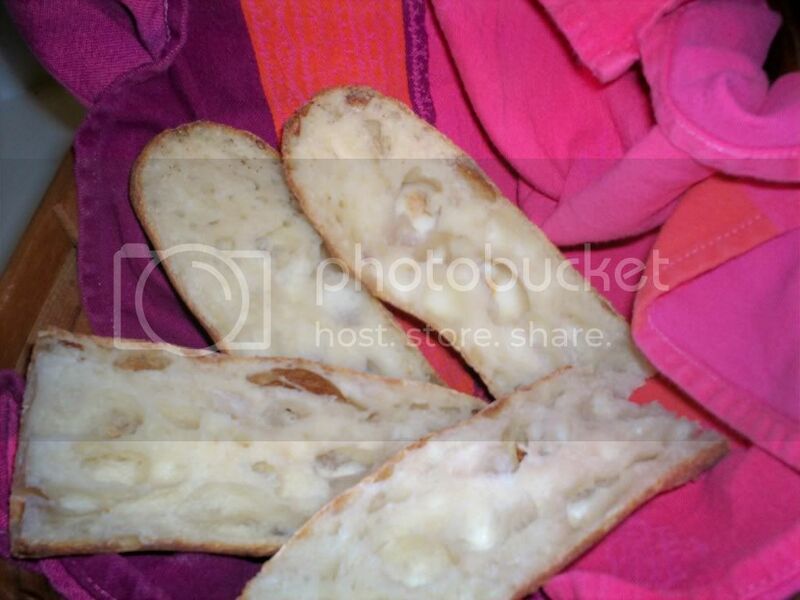 Mr. Ponsford told the tale of a starter that was grown in a wine cave that gave the bread a particular flavor - until it was removed from the cave. He also told the tale of a unique apple cider starter - but which was refreshed each day with apple cider. I'm not taking sides. I'm just saying. Both similarly felt that after passing from the culture phase to the starter phase there is no advantage (in terms of actual bread making) to the "150 year old starter carried across the Rockies." They are both convinced that the starter will take on the characteristics of your locale and promised that if you went to their bakeries and asked for a bit of starter (now, don't everyone rush to do this! ), they would gladly give you a piece because it will eventually come to reflect your locale and your level of care and itself was not the secret to their great breads. Again, I'm just saying what I heard. One gram of whole-wheat flour contains 320,000 yeast cells and 62,000 lactic bacteria cells. Moving on the starter care, I couldn't help but think of the hard hearted way many home bakers treat their starters - leaving them to languish in refrigerator for weeks at a time and reviving them only when they are needed. Starter care as discussed was for professional bakers, as feeding suggestions were given for feeding once, twice, or three times a day. Well, that stirred up some hard feelings. However I'll give you two quotes. Craig Ponsford "There is no shortcut to caring for your starter" and Jeffrey Yankellow "Treat your starter right." I don't have the qualifications to argue. In terms of the impact of sourdough on the final dough itself, they reminded us that the acid in the sourdough will strengthen the dough considerably and that more gentle mixing with the objective of somewhat under developing the dough would be something to consider with sourdoughs - allowing the dough to develop during the first fermentation. Mr. Yankellow expressed that he preferred to retard sourdough doughs after shaping as the acidity and long fermentation would strengthen the dough to the point where it would be difficult to shape. Well, that's enough controversy for today. I then toddled off to the Bread Bakers Guild of America booth to hear a presentation from a representative of the California Wheat Board. Apparently I've been studying about wheat a little too much, but one interesting fact is that California produces a particularly fine durum wheat called "Desert Durum" which is used in great quantities by the Barilla pasta company. Swinging by the LeSafre cup, I was able to see yesterday's creations. I was quite impressed by Costa Rica's colorful artistic piece. Argentina's and Brazil's pieces were also very nice, but I did have to ponder if they would regret their bland color schemes. We will know tomorrow. Once again the breads were lovely. Although I am completely unbiased, I still think Team USA rocked - but this is one tough competition. I can't wait to find out the results. I'm beginning to enjoy this "resting up and not pushing myself to the limit" thing and so left the show early, blowing off the Ciril Hitz book signing. Although I like him very much because unlike "my teacher" he doesn't yell at me and doesn't give me homework assignments that take years to complete (he was also the first person to introduce me to a sheeter - and he even remarked to me about the love light in my eyes), but I just wasn't up to beating off the vast throngs that would no doubt be there. I also don't want to lose that air of "I'm so cool I can hang with famous bakers and never even consider getting a book signed or a picture taken." Once you give in to that, well, you lose your street cred. Anyway, I have a lecture with him tomorrow. Monday 8:30 AM (Hey! This is like work!) saw a room full of bakers and imposters gathered to hear a lecture on commercially yeasted pre ferments from Didier Rosada and Jeffrey Yankellow. I don't think it is fair, nor do I think it is possible for me to record the entire content of this two and a half hour lecture in this blog. However, there are some highlights that bear reporting. Mr. Rosada introduced a slide on the effects of fermentation and told the crowd that the mastery of this slide was the secret to great bread. In short, fermentation produces CO2, alcohol, and acidity. And he then told us in short the secret to great bread: "The secret is time." Most home bakers are familiar with the principle of using pre ferments as a way to add flavor to our breads. However pre ferments create acidity and also start some enzyme activity. The acidity can add strength to a weak flour (up to a point) so a lower protein flour will perform like a higher protein flour. Liquid pre ferments in particular favor "protease" activity which degrades the gluten somewhat and can add extensibility to the dough handling qualities. In fact, a liquid pre ferment is the "classic" baguette pre ferment because a baguette must be rolled out and extensibility matters. This really gave me something to think about. For example, I have usually used a liquid pre ferment for my whole wheat loaves. However, because it is home milled and because the wheat is usually freshly ground, I am essentially adding extensibility to what is already a somewhat weak flour. It might be better to use a firm pre ferment and strengthen the dough a bit more. While we're on that topic, there was discussion on the how the percent of the total flour in the formula that is pre fermented also can impact dough strength (more pre ferment making the dough more strong). I've been yapping about the importance of this little variable on these pages, but it mostly gets ignored. I knew it was important because I saw what changes in the percentage of flour pre fermented made in my own bread, but I didn't know exactly why. This is Didier Rosada and Jeffery Yankelow (ok, I don't normally like to drop names, but this time I will) telling you folks - it matters. A higher percentage of flour pre fermented will increase flavor, but have such a large impact on dough strength that the dough is impossible to shape. Something to consider in formula design. I do think about these things from time to time. Mr. Yankellow gave us a brief presentation on that most controversial of subjects - standard terms for various pre ferments. I know that Humpty Dumpty is appalled by this whole idea, but I find it comforting to actually know what the person I am talking to means when s/he says "poolish" or "sponge." Maybe it's just a limitation of my tiny mind. Both of these gentlemen are advocates of salt in a poolish as it gives more control over when it will ripen and a longer "usability" window. Using pre ferments - particularly poolish - at the right stage of ripeness was emphasized. The lecture continued on with points that are more apropos for professional bakers than home bakers, but all in all it was still a very worthwhile session. Then it was out to the exhibition floor. I was immediately drawn to a robot bread scoring machine - which used a blade more closely resembling a tomato knife than anything else. For the individual looking for a home deck oven (breadfairy!) - well, this show really wasn't about home bakers. I did encounter several "small" deck ovens being used in demonstration booths. Miwe has the Gusto - which is a very small commercial convection oven, the Condo (small deck), and the Wenz 1919 - which they describe as a nostalgic deck oven. The Bread Baker's Guild of America demonstration oven was a Matador (deck oven) designed for "in store" baking - which had the cutest little loader I have ever seen. It is included with the oven, but I'll be doing research on buying one separately. There must be some way to rig that thing for home ovens. TMB baking was showing a TMB Mini Tube oven. No one had printed collateral. That's the best I could do. You can type those names into your favorite search engine. But while hanging about the combined TMB and SFBI (San Francisco Baking Institute) booth I did make quite a discovery. SFBI is creating videos that demonstrate the making of every product in "Advanced Bread and Pastry". They will be offering these as downloads with a projected subscription price of $60 per year. Sooooo cool! They scanned my badge so I will get an email when the product is finally released. Wow. The two or three people who actually read my blogs will know already that after getting a significant number of samples at the SFBI booth, I would be drawn like a moth to a flame to the Rondo booth where I could pine over a large variety of sheeters. I then stopped by the booth of some kinda ingredient seller to find "my teacher" forming high hydration baguettes and batards. Not only was it a joy to see those hands forming dough (and chat), but I found out that (shameless plug coming) The Bread Baker's Guild of America would be having a class in my very own Mile High City with "my teacher" at the helm. So would make me want to join to get the announcement on that class (if I were not a member already.) Wild dogs will not be able to keep me away. Then on to North Dakota Mills to chat about how we home bakers might get some of these more specialized flours (no conclusion reached - go to the website www.ndmill.com and find a distributor was their suggestion) but mostly to score a plastic scraper. I did drop by the Louis LeSaffre Cup where Teams Costa Rica, Argentina, and Brazil were baking, but my poor fragile feeties were beginning to hurt. Reminding myself that this was indeed a vacation where I wanted to get rest and care for my rapidly aging body, I decided to go back to the hotel and rest. Although I will not get to taste the offerings, they will be on display tomorrow. All in all a good day at the show. For me, to see "my teacher" made it the best of all possible days. So I sit with my feet propped up waiting for a decent time to have a martoonie (of course, this is Las Vegas...) in anticipation of tomorrow's session on levain based pre ferments. I can't decide if I am just pitiful or one very lucky gal. Sadly, in my quick turnaround at home, I packed my bags with the standard "four day domestic commute" accoutrements - which does not include a camera. I'm sure that official photos will soon be available and they will be much better than those I could have taken (not that it's hard to take better pictures than I do...) We all have lost opportunities to deplore. My primary mission today was to cheer on the USA Baking Team at the Louis LeSaffre Cup. For those of you who don't follow this closely (Mark!) this is the preliminary competition that decides which two countries from the Americas region will compete at La Coupe du Monde de la Boulangerie at Europain in 2012. As you recall, the US placed out of the top three last Coupe (you are all keeping track of this, right?) and instead of getting an automatic ticket to Paris, needs to compete its way back. IBIE is first and foremost, though, a trade show and there are always ripping good things to see. With all apologies and with due respect to those who see bread baking as a spiritual quest, I just love the big machines with the robotic arms that automatically mix, shape, and with the aid of tiny water jets even slash breads before conveying them to the oven. I could watch those big machines all day. While the artisan in me is suspicious of the bread that they produce, the engineer in me just thinks "Cool." I also scored a chocolate covered brownie - on a stick - from the Callebaut booth. Today team USA, Team Canada, and team Mexico were baking. One of the advantages of attending these competitions is that one gets to see and taste the output from bakers who are at the top of their craft. By applying my talent for infinite patience, I managed standing room within feet of the judging area and very near to that legend of baking Christian Vabret. I will have to say that it was a bit unthinking of the event organizers not to provide M. Vabret with a translator. Although I understood him, I could see him become visibly discouraged that so few people comprehended what he was saying. He deserves better. I was also puzzled that with Canada and Brazil in the competition that materials and signage were in English and Spanish only. Oh, well. I'd have to say as a completely unbiased spectator that Team USA rocked!!! Team Canada's (and Mexico's) and Team USA's breads were very different in style. Mr. Zakowski tends to bake his breads very boldly and includes a small amount of levain pre ferment even in his baguettes. Tasting is believing. I need to give some serious thought to bolder baking (now that I have an oven that works) and the hybrid baguette. Mr. Gadouas' pastries were excellent. Mr. Peemoeller produced an artistic piece celebrating the role of immigrants in the diversity of America and its breads. He included a highly abstracted version of the Statue of Liberty( with the flame made from a piece of croissant), a silk screen on dead dough version of the Declaration of Independence and a laminated live dough Constitution along with many examples of breads and allusions to the hard work building this country that was done by immigrants. It was brilliant. The two French gentlemen behind me remarked on the irony that the great symbol of America was really French. But I think that's what Mr. Peemoeller (with an accent that makes one think he might have moved to the US from somewhere else) was really trying to say. That America has the ability to take the best of the world and shake it up until it is all part of our identity. (I spent a lot of time watching the Armed Forces Network - I break out in public service announcements sometimes.) Which goes to show the power of his bread creation, that it actually could move one to deeper thought. It rocked! Sorry, but your feckless correspondent could stand no longer and left before Mexico's breads were judged. For the individual looking for deck ovens for the home, Team USA had a Miwe Condo deck oven. It was extremely compact and had a mini loader integrated into the oven design (sooooooo cool...). I have spoken to an individual who has a Miwe in his RV. This seems interesting. I will go to the Miwe booth tomorrow. But hey, I'm in Las Vegas! Enough of this blogging stuff - someone get me a martooni!